You wouldn't serve your flagship beer in a dirty glass, so why would you pour it from dirty tap lines? You wouldn't - that's a cardinal sin in this industry. But, sometimes the very important task gets overlooked. It's not as though you can look at your draught system behind the bar and see the story it tells like a spill in your walk-in cooler might or a sticky floor in your taproom. So how can you be proactive with tap line cleaning, and why does it matter? Anything that touches any kind of food or drink is bound to get dirty. Tap lines continuously hold beer in them as the liquid flows from the keg to the faucet. Over time, this beer forms calcium oxalate, also known as “beerstone”. Beerstone harbors a variety of nasty microorganisms, which will change both the quality and the shelf-life of your brew. Beer is a fragile thing and is often specially crafted. Brews are not only sensitive to light and temperature, but also to the lines that they are served through. Because of these factors, every little element must be considered so that you can ensure the best-tasting beer is served time after time. Your tap lines get a little dirtier every time you use them. Now, you probably won't notice this change on a day-to-day basis. The beer you drink Monday will taste roughly the same as the beer you drink on Tuesday. However, if you don't clean your tap lines, over time the beerstone (or bacteria) and even mold can build up. Eventually, you'll notice that your beer tastes a little off – sour, flat, buttery, or yeasty. Don't let your tap lines get to this point. If the beer tastes sour or flat, anyone who drinks it will likely be dissatisfied with their visit to your establishment. And don't forget about your reputation - people rarely return to places where they ate or drank something that didn’t taste quite right. Craft beer, in particular, is part of such a large community and movement, and social platforms like Untappd, Yelp, and Google Reviews grant your customers a space for commentary, ratings, and experiences. Don't give them a reason to mention your tap lines in a negative way! To prevent beerstone from forming, or to remove it once it has formed, you need to clean your tap lines every two weeks. To do this, water as well as a properly mixed cleaning solution needs to be run through your tap lines. You can't use just any solution; it has to be one specially formulated to dissolve beerstone and bacteria without leaving any residue behind and often involves materials like sodium hydroxide, potassium hydroxide, nitric acid, hydrochloric acid, and phosphoric acid. No chemical containing any amount of chlorine should ever be used to clean your tap lines. Tap line cleaning should be done roughly every two weeks with a line cleaning solution. This specially formulated solution will remove organic growth (like yeast or bacteria) from your tap line, hardware, and fittings. The solution also helps to prevent the growth of lactobacillus, pediococcus, and pectinatus – which are all forms of beer spoiling bacteria. In addition to that bi-weekly cleaning, your tap lines should also be cleaned with an acid line cleaning solution once every quarter. Acid line cleaner works to remove the inorganic materials from the interior line, and well as your hardware and fittings. Along with cleaning your tap lines, there are also specific guidelines for cleaning your hardware, pressure pot, and pump. Proper tap line cleaning always starts and ends with rinsing the lines with fresh water. It is especially important that after the cleaning solution has been run through your tap lines that you rinse until there is no chemical residue showing on tested pH strips. So why do some establishments skip tap line cleaning, or delay it further than necessary? It's not a glamorous job. It's time-consuming and inconvenient and not to mention messy. Any beer left in the lines must be expelled; it can't return to the kegs. 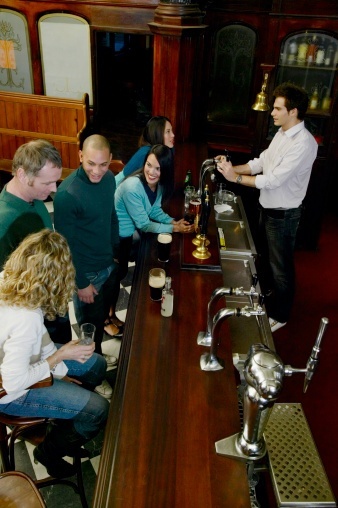 If bars or restaurants look at it from a revenue loss standpoint, it can be hard to watch that beer circle the drain. But, not pouring from the cleanest lines can mean lost revenue if your customers don't return due to a poor experience. Beerstone is harder to remove when it starts to gain a little traction, so if cleaning isn't done in two-week cycles, established beerstone will continue to compound. Some places choose to clean the tap lines themselves. Many may rely on specialized vendors who are qualified to clean their tap-line. Some suppliers require establishments to keep a tap-cleaning calendar or log in order for their beers to be on tap. This is one way the brewer or brand can ensure their beer is served exactly the way it is intended to taste. If you don't clean tap lines, you risk serving beer that does not meet the standards of breweries, distributors, and your customers. Ultimately, by not cleaning your lines you risk losing customers and profits. By cleaning your tap-lines every two weeks (or more, depending on your system), you can ensure your beer always tastes great and you're representing the brand in a positive light. This makes happy customers! Although Bernick’s is not able to clean tap lines because MN State Law prohibits distributors from doing so, we will work with you to find someone who can help you. Your brew tasting its best is our priority.